Dalieh, a landmark that extends south of the iconic Sakhret al-Raouche (Pigeon Rocks) on Beirut’s shoreline, served as one of the most vibrant accessible areas used by the city’s working class communities (Saksouk-Sasso, 2015; Legal Agenda, 2016; Dictaphone Group, n.d.). For decades, Beirut residents claimed Dalieh as an informal space for different economic and social activities that ranged from the Kurdish celebration of Nowruz to fishing and community diving competitions from the Raouche Rocks, as well as swimming in local clubs in the area’s natural pools (Saksouk-Sasso, 2015). Over ten Beirut-based families owned property on Dalieh either through direct sale or inheritance since Ottoman rule and the French mandate of Lebanon (Saksouk-Sasso, 2015). Although not designated as public property, the people of Beirut regard Dalieh as a public domain through various spatial practices, as architect and CCPDR organizer Abir Saksouk (2015) explains: “…despite this long history of various private owners, people have understood and used Dalieh as a crucial open-access shared space in the city” (p.305). In 2014, demolitions of fishermen homes, coupled with the news of planned construction of a private seafront resort in Dalieh, triggered the formation of the Civil Campaign to Protect Dalieh of Raouche (CCPDR) to preserve Dalieh’s rich cultural, ecological and archeological features as an “open access shared space.” This article examines the legal history of the privatization of Beirut’s shoreline and its current impact on Dalieh. It then explores how CCPDR acquired resources and tools to mobilize against the proposed resort project and challenge state planning regulations. 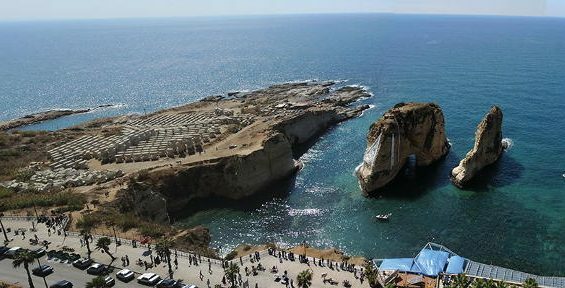 A brief examination of three pieces of legislation illustrates how a series of legal exemptions afforded investors access to Beirut’s shoreline and led to the announcement of a seafront resort project in Dalieh. Order 144 of 1925: Issued by the Office of the High Commissioner of France in 1925, Order 144 classified Lebanon’s shoreline, defined as the “furthest high-water point on the beach,” as an “inalienable maritime public domain” (Dictaphone Group, 2015). However, Article 14 of Order 144 stated that, “The state or municipalities can temporarily and revocably authorize the personal, exclusive occupancy of a piece of public property in exchange for a fee, especially if the matter concerns a certain project. The project shall be considered a concession if it is established as a public interest [...] provided that the rights of others are preserved” (as quoted in Legal Agenda, 2016). This provision resulted in the following legal exemptions over the last decades. Decrees 4810 and 14914 and of 1966: Decree 14914 issued by Lebanon’s Council of Ministers, prohibited construction on coastal land in Zone 10 (which includes Dalieh and most of Beirut’s shoreline), but allowed a 10% surface exploitation factor for real estate companies. Lebanon’s Council of Ministers then issued Decree 4810, which allowed for the exploitation of the maritime public domain, provided the government approves the proposed project and that resort owners utilize three times the surface area to build a marina (Dictaphone Group, 2015). Decree 4810 essentially gave a green light to property owners bordering maritime public property to utilize public property for private use, provided that it is an “exceptional action applicable in special cases” for public and touristic projects (as quoted in Legal Agenda, 2016). Both decrees allowed investors to seek legal exemptions so long as their project is public and touristic in character. Law No. 402 of 1995: Law No. 402 sanctioned the doubling of the exploitation factor for land plots with a surface area greater than 20,000 square meters (Dictaphone Group, 2015). Law No. 402 also allowed for significant land ownership change in Dalieh when, in 1995, three real estate companies (Al-Bahr Real Estate, Sakhrat Al-Bahr Real Estate, and Sakhret Al Yamama) owned by the late Lebanese Prime Minister Rafiq al-Hariri purchased most of the property shares from previous owners (Dictaphone Group, 2015). Before his assassination in 2005, Harriri reportedly envisioned Dalieh as a commercial and tourist project, so much so that in 2005 Hariri representatives tried, but did not succeed in buying out informal kiosk vendors along Dalieh (Dictaphone Group, 2015). The project’s goal was to dismantle the spatial practices of working-class communities in Dalieh largely deemed undesirable for the grand tourism project. CCPDR mobilized local and international media outlets, universities, and legal organizations to spread awareness about the campaign. Several local and international NGOs and media outlets publicized the campaign’s message, including: The Guardian, Al Jazeera, Jadaliyya, Beirut Report, and Environmental Justice Atlas. CCPDR used Jadaliyya’s media platform to publish a letter against Rem Koolhaas, the Dutch architect commissioned to design the resort, and his architecture firm, the Office of Metropolitan Architecture (OMA). The letter demanded that Koolhaas respond to reports of negative ramifications of the proposed project, and cited scientific studies that noted the project’s potential negative economic, cultural and ecological impacts. 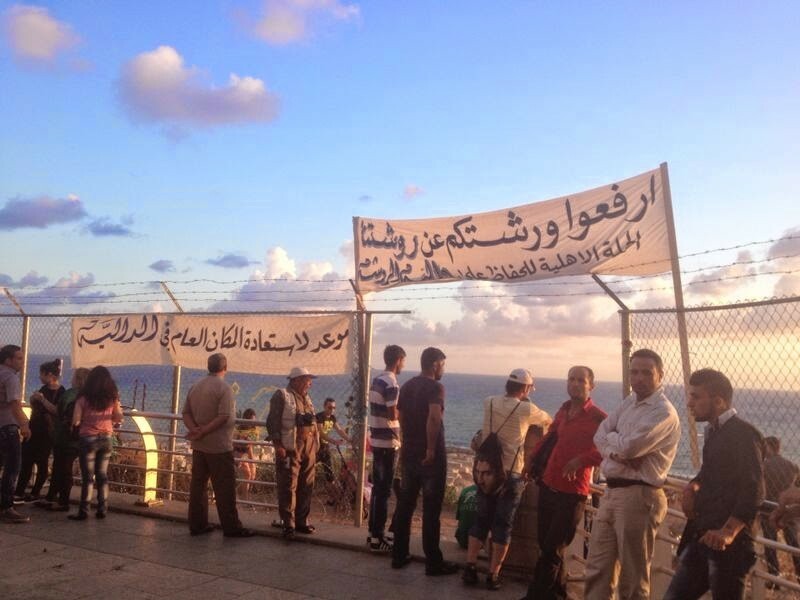 CCPDR organized several demonstrations and protests, including the “Encounter to Reclaim Public Space” to protest a 377-meter barbed wire fence installed by private investors to limit public access to Dalieh. The Beirut Municipality further deployed security guards and booths to limit the public’s access to the shore. Campaigners continued to organize music and banners every Sunday on Dalieh and documented Beirut Municipality security activities through their Facebook page. Moreover, the campaign used an approach that utilized participatory planning research to organize an Ideas Competition (CCPDR, 2014). The competition urged urban designers, urban planners, architects and residents to imagine and present an alternative plan for Dalieh. The campaign also issued the Dalieh Booklet which reprinted land use maps of Dalieh from groups like Dictaphone Group and Legal Agenda, a timeline of the campaign’s mobilizations and targeted campaigns, and vintage photographs documenting the historical and contemporary spatial practices in Dalieh (CCPDR, 2014). The coalition’s main achievements include filing a lawsuit challenging against Decree 169 of 1989 and prompting the Ministry of Environment to draft a decree to protect Dalieh as a natural site. Ministerial Decree 169 allowed construction in Beirut’s coastal areas and gave the green light for building a Movenpick Hotel in Dalieh. The group filed a lawsuit arguing the decree arguing it passed in secrecy during the civil war and planning bodies such as the Directorate General of Urban Planning failed to ratify it. In 2015, the Ministry of Environment announced it had drafted a decree deeming Dalieh a nationally protected area (Battah, 2015). Although the decree has not yet officially been approved, the draft decree stipulates that any construction on Lebanon’s shoreline needs an approved Environmental Impact Assessment. CCPDR’s advocacy for the right to space signifies its commitment to the management of the urban commons, rather than a privileged select few in Beirut who benefit from this kind of private investment in tourism or real estate ventures. The campaign also uncovers and disseminates knowledge about Dalieh’s legal developments otherwise not accessible to the public. Moreover, the campaign challenges both official planning bodies and their regulatory framework to achieve a more equitable distribution of public services that serve Beirut’s working class residents. As such, CCPDR demands Beirut’s citizens and residents be full partners in shaping Beirut’s urban future, especially when scarce, treasured public spaces are at risk. CCPDR situates spatial inclusion and participatory planning centrally in its Dalieh’s preservation goals to combat state authorities’ and builders’ efforts to transform public spaces into what Denis (2006) calls “spaces of privatized exclusivity.” Rather, the campaign highlihts Dalieh’s socio-spatial significance and its informal economic activities to emphasize residents’ rights in defining the coveted coastal space they utilize daily. Furthermore, CCPDR is clear in advocating against privatization, which benefits economically privileged Beirut residents who enjoy exclusive access to private developments that exclude working class communities. By challenging state planning decrees and promoting participatory planning objectives, the campaign advocates for the equitable distribution of public resources to avoid the reproduction of stark urban divides that have plagued Beirut since the civil war. CCPDR’s ability to mobilize and organize on multiple fronts helped to achieve its objectives. CCPDR launched a targeted campaign (See Image 2) to attract and garner public and media attention, established contacts with local and international media, and drafted historical land use planning maps for public use. The goal was to galvanize residents, legal experts, environmental justice organizations and urbanists to contribute to and utilize CCPDR’s research, to further their own campaigns about preserving public coastal areas threatened by privatization. Many other campaigns followed suit, namely the Ramlet al-Baida campaign against the privatization of a prominent beach in Beirut and a campaign on Sidon’s coast in southern Lebanon against forced land grabs on historical sites. Most importantly, CCPDR not only launched a targeted campaign against the proposed project but also offered viable alternative designs proposed by the local community, students, and professionals. Alternative design proposals separated CCPDR from other campaigns in Lebanon. The adherence to a community-based design approach bolstered the campaign’s objectives and forced, for example, the Ministry of Environment to draft a decree designating Dalieh as a nationally preserved area. Regionally, others have been advocating for the public’s right to shore and coastal areas. In Egypt, for example, a collaborative project similar to that of CCPDR, involved several graduate students from Cairo University, the University of California, Berkeley, and the American University in Cairo titled “Connecting Cairo to the Nile River: Renewing Life and Heritage on the River” to reclaim the Nile River banks for people in Cairo. Due to military and private use along the Nile River, Cairo residents have little access to the Nile riverfront. Recent municipal and governorate decisions sought to limit even further the ability of fishermen to take small parties on their sailboats (felucas) for a few relaxing hours on the river. After surveying four Cairo districts along a 12-km stretch along the Nile River, the team developed a plan for a continuous trail network connecting the Nile riverfront to other important areas of Cairo. The project, much like CCPDR, recognizes that everyday urban experiences in largely congested cities are enriched by the public’s access to shorelines. Unfortunately, significant obstacles of government, private, and military ownership and use of the shoreline remain and this important pedestrian and shoreline trail remains only an academic vision. Dalieh represents a space of cultural, social, economic and ecological significance for Beirut residents, given that market-driven urban development has made public space accessibility for working-class people scarce. The fight for Dalieh is far from over, but The Campaign to Protect Dalieh of Raouche provides an example to other grassroots urbanist organizations in Egypt and the MENA of how to fight for the right to the city. Much like the “Connecting Cairo to the Nile River” project, CCPDR shows that similar urbanist-oriented projects can stimulate necessary public discourse and collaboration among organizations and initiatives in the MENA, if not eventual realization of greater public access to public space, including coastal areas. Reclamation of vital public spaces through mobilization of the city’s and region’s organizational infrastructure, legal activism challenging the state’s regulatory framework and the implementation of participatory planning tenets, especially in cities like Beirut and Cairo, may still improve its citizen’s daily urban experiences but far more still needs to be done. Surface exploitation factor is equivalent to Floor Area Ratio (FAR) and measures the total amount a building has or has been permitted construction on, and the total area of the land or lot the building is on. Denis, E. (2006). Cairo as Neoliberal Capital? In Singerman and Amer (2006). Eds. Cairo Cosmopolitan: Politics, Culture and Urban Space in the New Globalized Middle East, American University in Cairo Press, 2006; paperback edition 2009. Saksouk-Sasso, A. (2015). Making Spaces for Communal Sovereignty: The Story of Beirut’s Dalieh. Arab Studies Journal, 23 (1), 296.